Discussion in 'Draft Games Forum' started by Edgar Allan Pillow, Aug 28, 2018. Always wanted to do this. GOAT player at his position, but rarely gets appreciated ond often considered a defensive weakness. Almost always mid to late round pick and falls despite Falcao and Redondo getting more appreciation. Probably my favourite player - will have a think on this later. Class act. The template is definitely there though ^ I don’t think Pirlo is as hard as the others. Whilst he thrived in a diamond and a 3-1-4-2 I really think he'd love a 433 with some better wide options. The starting XI of the 2005 CL final is the perfect option. Yeah. Just struggling with the #10. Quite like the Gullit shout actually. Hmmm. Reason I hesitate is I’m just not sure I love the obvious Gullit / MVB duo in a side without huge amounts of width. Don’t think it makes the most of their assets. And then also it seems like falling for the obvious Milan link but maybe not the best for Pirlo. In fact I’m convinced it’s not, when he’s at his best he’s looking for runners and threading through balls. I think more subtlety and raw mobility works well for him. Clear play making duties lie with Pirlo - provided the perfect platform with a rock solid midfield and defence. Gattuso at RCM may raise some eyebrows but I'd argue he's the best available option for the job. Does he need to create chances? Nope. Just run, win possession and play it simply. Perfect support player. Kaka / Ronaldo / Romario - all lightening quick and explosive in their unique ways. The movement of the ball from that front three would be frightening, Pirlo would be like a kid in a sweet shop deciding whether to pick out Romario on the last man, Ronaldo peeling into the channels or slipping Kaka through as he breaks through the lines. I'd put Cannavaro in place of Nesta though. 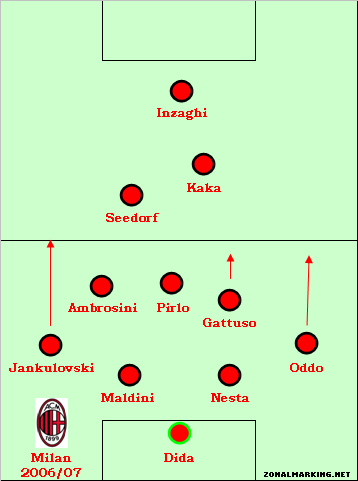 Nesta-Baresi is indeed a bit redundant even though definetely functional. In the diamond, either the wide midfielders or the wingbacks need to stay behind in case of a counter. The 3511 offers the full license for them to get forward. Additionally, it makes the build up easier in possession and allows for a 5-man-defence if you want to park the bus. 1) I researched Gullit for the P&G Draft and he really went up in my estimation. 2) He's versatile and technically excellent who is happy to play second fiddle. 3) You want more of an 8ish 10 with Pirlo to give him full creative control. I get the point about width with respect to MVB and Gullit but even in a diamond I'd like at least one aerial option for the full-backs, that said with Pele you do have one. So for the diamond team above you could replace Gullit and MVB with Nedved and Romario. Completely agree with your take on Gullit. I responded to Moby above and said I think it’s a great shout - think it’s a better fit than MVB in a Pirlo side. Only two things in everything you’ve said that I slightly disagree with (more subtleties than anything). For the #10 I don’t think it needs to be an #8 type per se, it just needs to not be a dominant playmaker - so you could therefore have an #8 type like Gullit, or alternatively a goalscoring #10 like Kaka. I feel like the latter is a better fit with the rest of the midfield, as well as having that electric pace which was perfect with Pirlo. Second thing I slightly disagree with is on Pirlo’s passing options, agree he’d love to spread it wide but imo the most devastating passes Pirlo would play were through the lines centrally (no surprise given he’s played most his career in diamonds). I think with Pirlo the most effective passing options you can provide him with are those balls over the top or through gaps between defenders - basically the type of run Romario would make as his bread and butter playing on the last shoulder. Similarly for someone like Kaka breaking through the lines was a core part of his game and there’s probably no one better than Pirlo at picking those central runs out in congested central areas. 1. 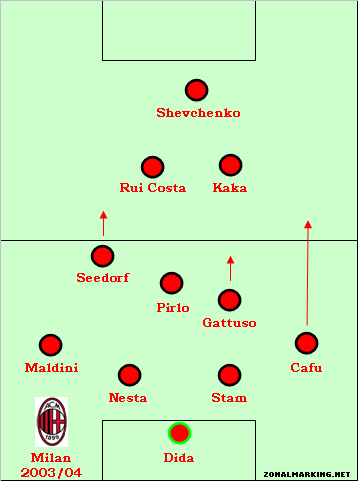 I think Rui Costa was the key link up man in that scenario who added to the fluidity of the team. I prefer RC to Kaka in formation above. 2. Also feel wide FWs like Henry and Kalle would be better. Yeah all fair enough views, no right answer to this really. 1. Disagree personally that Rui Costa fit as well as Kaka did. Great player but just not quite as necessary imo. 2. Yep Henry fits like a glove - a perfect fit. I just think Ronaldo offers similar ability to run the channels (peak Inter version) whilst being a better player. I think both are a better fit than Rummenigge. 3. Maldini was great in that system so don’t see any need to change it. I know the perception of him is that he was a defensive fullback but he was very effective going forward, remember him being great as a wingback at times for Italy. I think maybe Euro 2000 but would need to check. I think there's a very valid reason for Kaka over Rui Costa here. If you put Rui in, you have 4 midfielders who will score next to no goals. Maybe not decisive in a single match, but over a season it would be bad. Rui Costa scored just 4 goals in 124 league games at Milan, he also failed to score in 3 seasons there The pressure would be very big on Romario and Ronaldo to deliver all the goals and of course can they give you dozens of them, but it may not be enough if none of your other players can chip in with some. I thought Rui Costa was pretty average at Milan. He went to them seemingly at the peak of his powers and a player i loved watching at Fiorentina, then overnight seemed to lose a few steps, at least at club level. Kaka definitely works with Pirlo, you don't need an 8ish player necessarily, just not a proper playmaking 10. Another option is Dinho at 10 although he may command too much of the ball. I just think in an all-time context Kaka's peak wasn't that high and was too short. I think Pirlo's overall passing range was excellent. That he played the eye of the needle central passes I think is more a function of the then, and continued, lack of wingers in Italian football. I think you want options central and wide to take full advantage of him. I just think in an all-time context Kaka's peak wasn't that high and was too short. Really? I would definitely question the high part and while the short part is reasonable, it still wasnt too short for me. He was on the top of his game and world for 3 years. A lil short of the likes Dinho but still not very short. His Madrid stint really ruined his reputation. I remember during drafts on other forums which were relatively modern, I used to love picking him. Yeah. Obviously influenced by the way Milan and Italy played, but regardless he picked out central runners better than anybody probably since Laudrup. Him and Kaka were such a devastating combination and I'd always pair them in this thread. The only way teams could stop Pirlo was to play compact and squeeze the space in the midfield. And if they did that Kaka was fantastic at breaking the midfield and defensive lines in one searing burst. Drop off and stop Kaka from getting in behind and Pirlo would run the game, or push up as a team to congest Pirlo's space and Kaka would punish them. Either way you were fecked. Yeah. He was still classy and elegant, but powderpuff (3/5 seasons without a goal) compared to his more dynamic self in the 1990s in Florence. Kaka at his peak was a phenomenal player, single handedly knocked us out during one of our great seasons. His assist in 2005 final is an absolute sight to behold. Really nice thread for me. When decided to go with him for this draft, was thinking exactly the same during the weekend what EAP said in OP post about some people almost seeing him as a liability in the defensive sense which is a bit crazy considering what kind of player he was and what he accomplished. Basically, the only thing he didn't win is Euro and even then he got Italy to the final being MoM in 3 games for them. Played also in 4-4-1-1 in WC win alongside Gattuso and did brilliantly. In short, was thinking to put something a bit more creative alongside him with a good enough engine and for example, someone like Neeskens would be great in that sense imo (can say that because he is already picked). Also, Kaka is getting really underrated here. He was a brilliant player at his peak and it wasn't so short. As Id said that Madrid stint really looks like it ruined his reputation a bit. As much as I loved Rui Costa, Kaka was a superior player in many ways (his passing ability is also underrated) and a much better fit for a team with Pirlo in it. Just my 2 cents as it was interesting for me to see this thread after I picked him. Will try to find and put something a bit different though as I already said. How do people rate Pirlo in terms of modern day midfielders and say compared to Xabi Alonso for example? Too many times we've seen him being judged more of a passenger in drafts and a modern day version of Gerson. To be fair, he's way more worse than Gerson when it comes to work rate which says something. In an all time game against great Number 10's and supporting midfielders, I think his sides would struggle in general. Don't think its anything to do with rating him, drafters place high emphasis on the defensive weights of mid fields (which is fair considering the plethora of GOAT AM's and B2B's) and Pirlo is as big a passenger as it gets. You'll definitely not reach a final with Pirlo if you get to face someone like Maradona or Platini or Cruyff in between no matter who else you have in midfield. Another option is to drop Figo for say Neeskens and Thuram for Cafu. Defensively Xabi is slightly better. Offensively Pirlo is leagues ahead. Pirlo is worth building a team around, Xabi just adds value to existing teams. Yeah. I think folk look at the head-to-head on the graphic and see a GOAT 10 directly up against Pirlo and it looks bad - even though for Italy, Milan and Juve, midfield was always a collective zonal job supported by serious grafting and defensive nous from his team-mates. Decided to fashion a fairly cagey and down-to-earth Italian XI around Pirlo, with a combination of older and modern players - touching upon almost every great generation aside from Pozzo's. Definitely not the strongest team that's going to be posted and fairly wonky as opposed to a straight up diamond or 3-5-2 that has keenly calibrated components, but Italy has a bottleneck in certain positions and didn't always build the most conventional XIs for major tournaments. Though in terms of the primary objective of Pirlo being the star of the team as an architect, it's decent because he should have a lot of freedom to explore the central channel, and have the ball pretty much all of the time given the lack of playmakers (that will undermine him) in defense and midfield areas. Even from the view of the team overall, only Baggio and Conti will want the ball, and they're playing in very different zones. Tardelli was adept at peeling a bit wider for both Juventus and Italy, most notably to disorient the opposition's shape for Platini to exploit, on top of his box-to-box prowess, so he's a good fit for the mezz’ala-ish role Perrotta had in 2006. Gattuso had to start because of his special understanding with Pirlo. Burgnich isn't an obvious choice at rightback in terms of providing width, but IMO, the defensive cover rightback is a historical trademark of Italy with the progression from Burgnich -> Gentile -> Bergomi, and they were all far superior to Zambrotta. Additionally, the presence of Conti ahead of him alleviates some width related concerns. 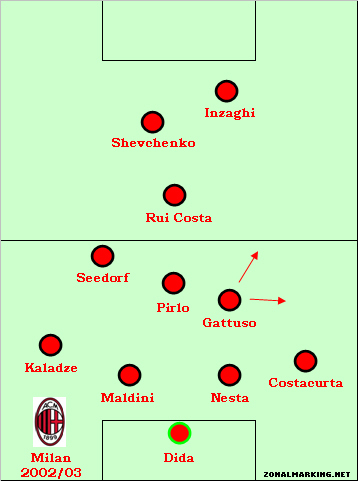 The rest of it is pretty straightforward with Picchi in a conservative sweeper role where he leaves almost all of the playmaking to Pirlo (you could argue that there's a discernible qualitative gulf between him and Baresi/Scirea but they would have been a bit more intrusive and Picchi has experience with Suárez), Facchetti providing the bulk of the width on the left side in a Catenaccio flavored defense, and Baggio as the trequarista behind Riva in attack. Great job @Sonnet XVII Wonderful side and really insightful post. I'd vote for that every time in a draft game, looks well thought out from back to front. Curious what people think of something like this. Didi pirlo wont work at all. Both are hugely ball dominant players and you have the real world example of didi and stefano struggling to co-exist, secondly you need an all-time great ballwinner in that midfield as you are not getting a lot of work-rate from either of them. More like Didi and Neeskens overlapping as they are very similar players and I rate Neeskens ahead. Didi doesn't offer anything that Neeskens doesn't. And as MJJ said, you need a ballwinner to balance that midfield out. When you have Pirlo playmaking, both Didi and Neeskens are really superfluous in central midfield, you may as well have a better goalscoring AM ahead. Didi-DiStefano was more on ego and not on football related issues. Agree with rest. I meant more in terms of didi not sacrificing his game to accommodate di stefano compared to players like puskas or kopa who modified their game to play alongside a primary ball handler. Interesting that you consider Didi and Neeskens similar. What your opinion on their skill difference?